In 1990, the U.S. Congress passed the Global Change Research Act “to assist the Nation and the world to understand, assess, predict, and respond to human-induced and natural processes of global change.” Under this mandate, the U.S. Global Change Research Program (USGCRP) was born, an innovative, cross-cutting research initiative that brings together the science arms of 13 federal agencies working on global change issues, including the Departments of Agriculture, Interior, Energy, Defense, the Environmental Protection Agency, the National Oceanic and Atmospheric Administration, and others. On September 15, experts associated with the USGCRP gathered at the Wilson Center to discuss one of the program’s flagship initiatives: the production of the National Climate Assessment (NCA), a periodic report that supports decision-making across the country by assessing and communicating knowledge of the impacts, risks, and vulnerabilities associated with a changing global climate. The third ever NCA was released in 2014 but planning has already begun for the next iteration to be published in 2018. 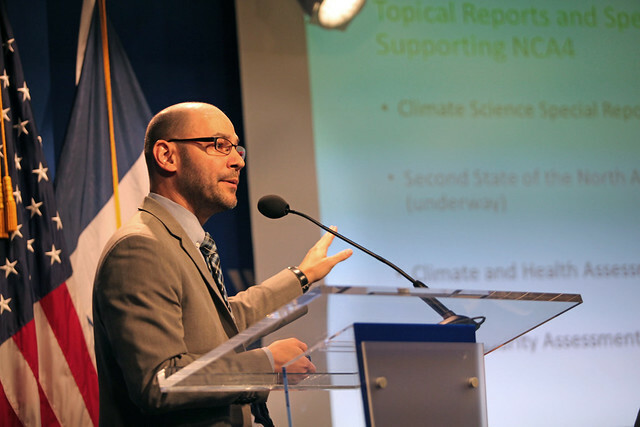 “The intent of the NCA is to analyze the effects of global change on various sectors,” said Ben DeAngelo, deputy director of USGCRP. The next assessment will cover the natural environment, agriculture, energy production and use, land and water resources, transportation, human health and welfare, human social systems, biodiversity, and other sectors, as well as detailed regional chapters and case studies. And for the first time, it will also have content about climate effects beyond U.S. borders. In many ways, the NCA is the national version of the global assessment reports prepared by the Intergovernmental Panel on Climate Change (IPCC). It compiles and synthesizes the most up-to-date scientific information on climate change and its impacts, with the aim of making that information accessible to decision-makers to support effective plans and policies. The general outline of the fourth NCA has been released and includes regional analyses as well as in-depth sectoral analyses of issues such as water, energy, ecosystems, coasts, agriculture, and human health. Individuals from various federal agencies will serve as lead authors for the sectoral chapters, while qualified individuals from outside the federal government will be selected to lead the regional chapters. The assessment will also outline response measures to achieve mitigation pathways that minimize risk and build adaptation capacity and resilience, DeAngelo said. One resource that could be drawn upon for the next assessment is the U.S. Climate Resilience Toolkit. This web-based toolkit, maintained by the National Oceanic and Atmospheric Administration (NOAA), helps people find and use tools, information, case studies, and subject matter expertise for climate resilience. The toolkit also houses a series of training courses that users can access at any time on technical topics like how to use downscaled climate data, visualizing coastal changes, and an introduction to adaptation for local governments. “The website is meant to help a broad range of decision-makers understand climate change and integrate it into their planning and day-to-day use,” said Nancy Beller-Simms, a program manager at NOAA, making it an ideal resource to highlight for local policymakers hungry for information. While historically the NCA has focused on domestic impacts and response strategies, USGCRP will for the first time include a chapter on international issues in its next report. Just what form that will take is yet to be determined. “Our discussion today is a good opportunity to begin to think about how the international chapter will be shaped,” said John Furlow, climate change specialist with the U.S. Agency for International Development. USGCRP has an established track record of coordinating and partnering with other nations and international institutions in its work, including sharing Earth observation data and coordinating U.S. participation in IPCC assessments. But bringing an international dimension to the national assessment is a new undertaking, and the form it will take has yet to be determined. Participants in the September 15 session suggested the fourth assessment could report on U.S. participation in international agreements and obligations under various treaties, or how U.S. programs in disaster risk reduction around the world link to climate change and its impacts. It could feature case studies of effective adaptation, like those featured in the U.S. Climate Resilience Toolkit; highlight cases where maladaptation resulted in increased vulnerability for people and landscapes; or detail the ways in which the impacts of climate change around the globe have implications for the nation. USGCRP is eager for additional ideas and from potential users, Furlow said. Technical input for the fourth NCA will be accepted until January 15, 2017, and those with ideas and knowledge to share are encouraged to visit the USGCRP website for more information on how to submit technical input. Given that this is this first time this flagship national report will include international content, this is a significant moment to influence the shape of future assessments. “This is a key opportunity for the adaptation community to weigh in on what would be useful to us,” Furlow said. Kathleen Mogelgaard is a writer and analyst on population and the environment, and a consultant for ECSP. Sources: U.S. Climate Resilience Toolkit, U.S. Global Change Research Program. 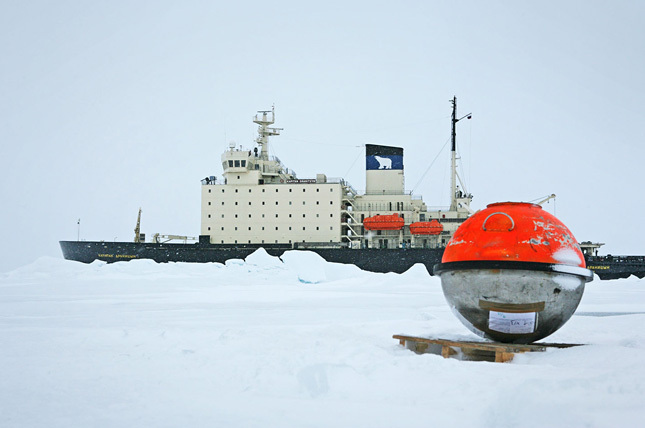 Photo Credit: A Russian ice breaker taking part in a NOAA program in 2006, courtesy of Mike Dunn/NOAA.